This customer had come to us approximately last spring. 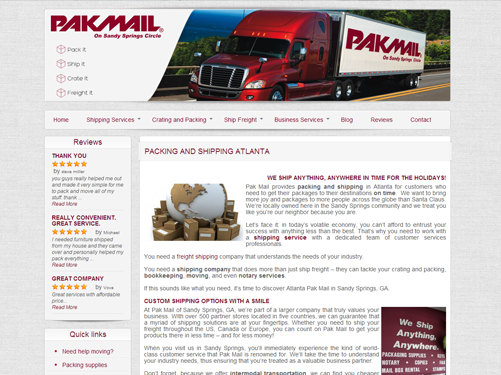 They asked us to design a website for their packaging company, which was a part of a larger company and located in Atlanta. Our task was to create simple corporate website for their company. To provide visitors a way to easily find the information that they need, like company services, information about shipping, contacts, etc. Also we created a blog where they can provide different sort of useful information, such as packing tips or how to plan your moving into new place. Also we created possibility for their customers to rate work of company and to leave their reviews about quality of work. We used WordPress as content management system for this website.